Storytelling is a vital element of content marketing. So it is no surprise we can learn a thing or two from fiction writers. Stoney deGeyter, President of Pole Position Marketing, is currently working on a novel titled A Crossed Time. As he wrote, Stoney found many strategies he used to author his book were tricks he could use when creating content for clients. 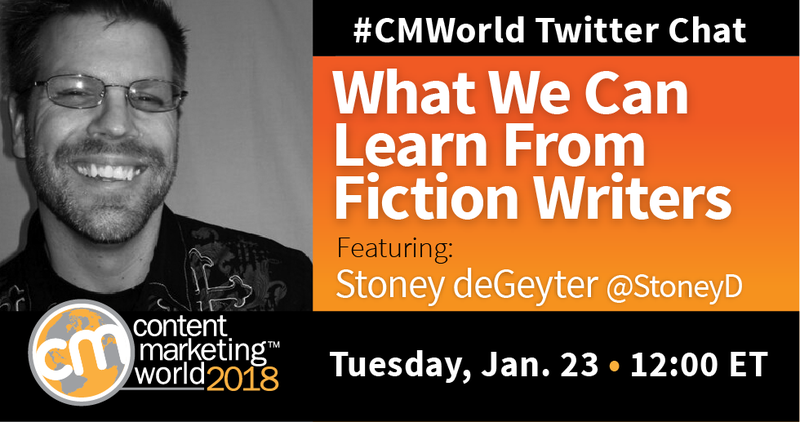 To tell us more about his experiences, Stoney joined us for a recent #CMWorld chat. What are the similarities in writing fiction vs. writing content for the web? – It’s best if you write perfectly for the audience you’ve got in mind, and forget what everyone else would want. – Good stories will engage people and add depth to your content. How can writing (and reading) fiction help you explore new and innovative ideas for your content? The more you read, the better you write. It’s not a myth. You’re unconsciously expanding your vocabulary and engaging creative thinking skills. According to Faulkner, writers often “borrow” from other authors. So we asked our community what fiction writers they have learned from. This chat motivated us to choose one good read this month for inspiration. It also made us want to pick up pen and paper and begin writing! There is always a lot of excellent insights during our #CMWorld chats. If you’re interested in participating in future discussions, you can find our chat schedule here. And if there is a specific topic you would like to see covered, please let us know in the comments below. Hone your writing skills. Attend Content Marketing World 2018 to learn from the industry’s top experts. Register with code SM100 to save $100 at checkout!